Passez une journée sur l'eau avec la charte de Reve de Nav vers Les Saintes de Basse-Terre. 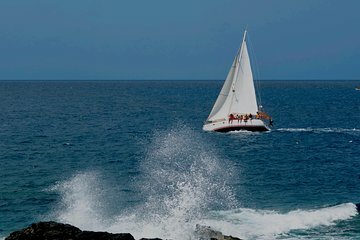 Naviguez vers différents points d’intérêt en Guadeloupe, comme l’île de Cabrit et Terre-de-Haut, avant de vous arrêter pour nager ou plonger avec un tuba. Il faut deux heures pour naviguer aux Saintes et vous aurez même la chance de diriger le navire aux côtés de votre capitaine-instructeur. Un repas créole est servi à l'heure du déjeuner. Arrivée à la marina Riviere-Sens au coucher du soleil. Wow, what a day out on the water in beautiful Guadeloupe. One could not ask for better, the company was great, the skipper/guide was excellent and the tour itself was amazing. My wife and I along with our good friends booked this outing with a small amount of hesitation wondering if we would be booking a trip on the infamous party boat with loud music and drunken teenagers. We were very pleasantly surprised when we met Woody and his wonderful family who we gelled with immediately. Our host/skipper/guide Olivier was so professional in his task and ensured we really enjoyed our day and remained safe all the time. The food he served at lunch time was delicious and all snacks were very tasty too. Then to top it off Olivier served us up his own concoction of traditional drinks, mmmh, very good. We would definitely recommend this trip to all. Phillip was a skilled captain, a charming host, and a chef to boot. We loved our day on the high seas. I even learned to tie a sailor’s knot!